Casino Heroes (Formerly known as Casino Saga) promises one of the most innovative, entertaining online casinos available. 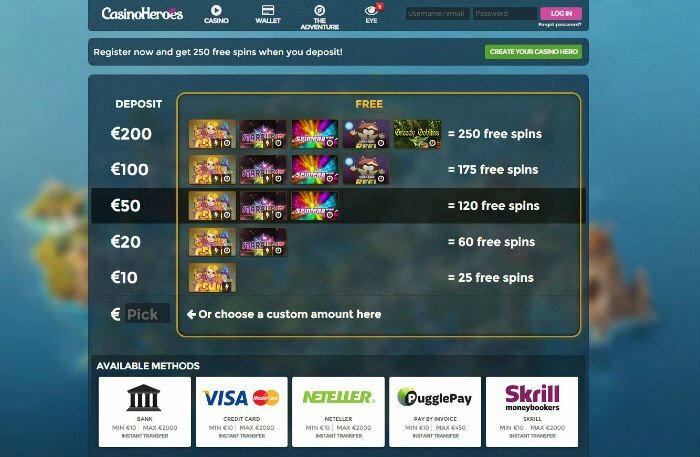 Play Casino Heroes for a unique online gambling experience. It’s a journey and an adventure where players choose an avatar and play casino games to progress through different levels or “regions”. 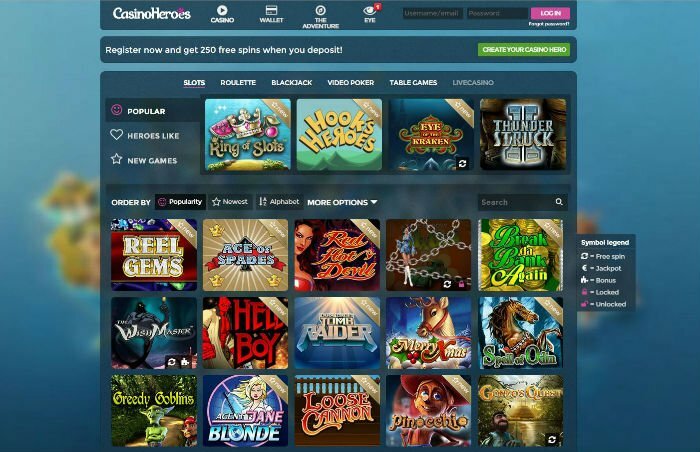 Although the site still seems in early development, we, at VegasMaster can’t get enough of Casino Heroes and recommend it to all of our readers. Don't be fooled by the low score in banking and customer service, every player should give this one a try. Think Dungeons and Dragons meets the online casino. It’s an online casino that resembles an adventure video game paired with the excitement of winning real money playing casino games. First of all, Casino Heroes offers the standard selection of casino games including slots, roulette, blackjack, poker, and so on. Most of the Casino Heroes games feature state of the art 3D graphics from software providers like Netent and Betsoft. In the words of its founder, George Westin, “We will not have games on our site that do not meet high standards for great graphics, high usability, and high “payouts”. Get a full interview with George Westin, the Founder and CEO of Casino Heroes. Starting out, players choose one of the 10 avatars available. There’s the Viking lady, wizard, knight, or secret agent – just to name a few. Then you can start playing games to win points. After reaching certain point goals, players must defeat the boss at each level. Beating a boss brings lots of bonuses making this casino especially exciting. Think Dungeons and Dragons meets the online casino. It’s an online casino that resembles an adventure video game paired with the excitement of winning real money playing casino games. As you progress through the casino world, you win extra prizes for fulfilling missions. Each mission involves playing different games and beating bosses within different regions of the Casino Heroesworld. After each victory, your Casino Hero gains XP points and earns rewards. The higher XPs you have, the more likely you will beat the boss and win lots of money. It really resembles a video game, except you get paid for your hard earned work! 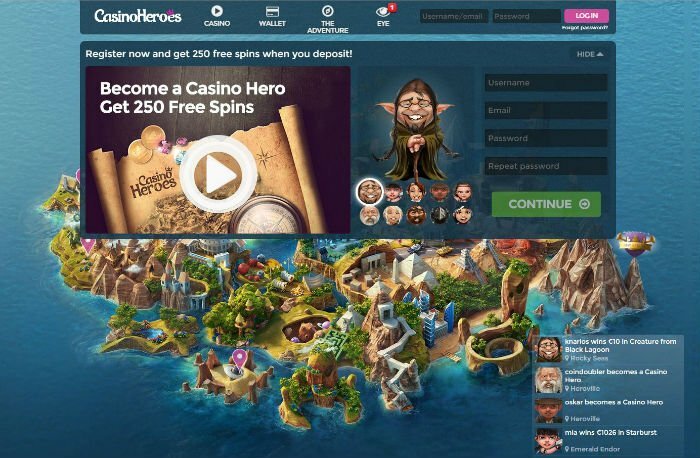 Currently, Casino Heroes only accepts a handful of reputable payment options for making deposits and withdrawing payouts. Players can use their bank, Master Card Credit Card, Visa Debit Card, Skrill Moneybookers or Neteller Instant Transfer. This site is still very new and only offers limited banking. However, we expect the banking options to increase over the next couple of years. Casino Heroes just got started, so it’s clear that they’re still working on getting things set up. For now they only offer costumer support via email. In addition, they have a database of the most common questions to help guide players. Hopefully, they will improve their customer support over time. If I had to guess based on the professional level of the casino, the customer service will improve. LOVE the concept. This takes online gaming to a new level for sure. I love picking out my character and going through the SAGA 🙂 Definitely one to check out. Who is your favorite player on Casino Saga? I love being the knight! I like playing as the wisseee wizard. I win a lot with him! Does each player avatar have certain advantages? No, just choose the avatar that suits you best. Then you gain points as you win and advance through the levels. What software does Casino Saga use? Casinosaga uses Netent and Betsoft, two excellent quality gaming softwares.